Happy and blessed Friday readers!! Thank you for stopping by! It’s time to introduce another gem of a book that we at Reading with Your Kids have thoroughly enjoyed reading. 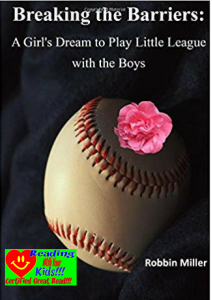 That book is Breaking the Barriers: A Girl’s Dream to Play Little League with the Boys by Robbin Miller! Not only did we enjoy reading Breaking the Barriers but we were truly inspired by the powerful story of Robbin Miller playing the little league with boys in 1975. We hope you and your family enjoy reading Breaking the Barriers as much as we did. We also hope that this book will be a great help in inspiring girls to have a choice to play little league with boys and to stand up to the obstacles they may encounter along their journey! Congratulations to Robbin Miller for winning RWYK Certified Great Read Status for Breaking the Barriers: A Girl’s Dream to Play Little League with the Boys! During a summer family picnic in 1974, Robbin observes a little league game being played in a nearby baseball field. Seeing how much fun the game was, and watching the fans cheer for their teams, Robbin asked her dad to teach her to play baseball. As she practiced, over time, Robbin learned that girls were not allowed to play little league baseball with boys. Refusing to give up her dream, Robbin was excited to learn about a famous court case that ruled that same year, that girls were to be allowed to play little league with boys. The long-standing barrier was finally lifted, and Robbin signed up to play in 1975. A brave and determined Robbin strutted her stuff and showed her community that she could play ball just as well as the boys, on any baseball diamond. Despite encountering jeers, boos, and name-calling from the stands and from the boys, Robbin excelled on the field and played with her head held high for the love of the game. Robbin Miller is a Children’s Book Author and mother of an 8-year old son, named EJ. This is Robbin’s first chapter book for children ages 8-11 years old. Robbin published two other picture books, “Playgroup Time,” and “Three Best Friends,” since 2015. 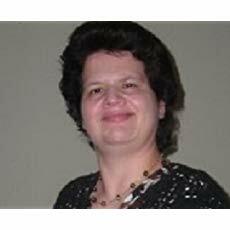 Robbin enjoys writing picture and chapter books on interesting topics for children and their parents. Robbin is proud to tell her story of playing little league with boys in 1975. She wants to inspire girls to have a choice to play little league with boys and to stand up to the obstacles they may encounter along their journey. These crucial life lessons that Robbin learned along her path helped her in being resilient and persistent in developing her goals in life. Robbin is very appreciative and blessed that her parents and brother, Bruce stood behind her while she crossed the sidelines to play little league with boys. Finally, Where Can We Find Robbin Miller Online? Kudos to Robbin Millers for writing such a wonderful book that inspires girls to pursue what they love and encourages them to play baseball. We absolutely LOVED reading Breaking the Barriers! With her beautiful life story, we’re sure this book will inspire girls to believe in themselves and will motivate them to play little league or whichever sports they are interested in! Breaking the Barriers is a historical non-fiction chapter book written by Robbin Miller. 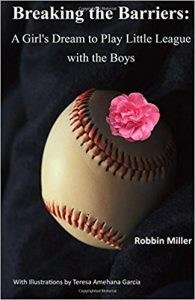 With 11 chapters and 70 pages, Robbin book tells her story of playing little league with boys in 1975 after it became legal for girls to play with boys in 1974. This creates an interesting angle for the reader, granting them all access to the history and facts, but also allowing them to understand what was going on surrounding the game, rather than just statistics and figures about what happened. It truly helps the reader feel as if they are at the game. Robbin describes how it felt to be one of the first girls in northeast Queens to brush off society’s expectations and step up to bat in the mid-to-late-1970s. Usually, any story about a sport is focused around a boy, especially one like baseball. It was nice to read a story that shows that girls can play any sport a boy can. Robbin writes about her struggles to prove herself time and again that she could play just as good as the boys. With support from her parents and brother, who also played as well, the author learns the valuable life lessons of courage and determination on the baseball field. Despite encountering verbal abuse from the stands and from the boys, Robbin outshined on the field and played with her head held high for the love of the sport. Robbin also mentions how society has still not changed for girls. Girls who play baseball and Little League, even now, are discouraged from continuing by the time they get to middle school and are told to go into softball. The law was passed in 1974 by President Ford and even after 40 years, there’s still some backlash against girls who want to play Little League. Through her life story, Robbin motivates other girls who would like to play little league with boys. It also inspires them to stand up for themselves with grit and determination and to never let anyone tell them what they can and cannot do. We would totally recommend this book if you were wanting to talk about empowering girls to follow their dreams. We love that this book is focused on going against what was “normal” and making your dreams possible. Breaking the Barriers tells a true story of determination and heroism, a gem of baseball history sure to inspire girls of all ages. By being calm and collected, Robbin was able to show everyone that girls can do whatever they want by doing their best and never giving up. It’s an excellent summer read for children ages 8-11 years old. PreviouslyAuthors Nancy Churnin on Picture Books, Hidden Heroes & More!! Read NextLet’s Discuss “Ten Little Night Stars” by Deb Gruelle! !